Nature printing and spray painting of industrial materials, such as metal mesh, can add a unique dimension to many artistic projects. We have a gallery of these projects and techniques here. 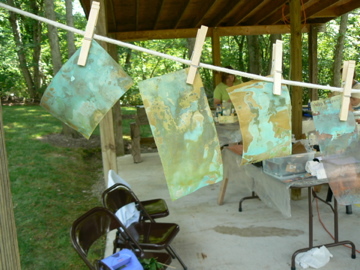 For complete directions on how to do nature printing on metal mesh, see LK Ludwig's article in the spring 2006 issue of Cloth, Paper Scissors magazine. Our mixed media group roughly followed these instructions, experimenting with other objects as stencils and using other patina solutions on the metal. The results were spectacular as you can see in this gallery of photos. Details are provided with the photos below. 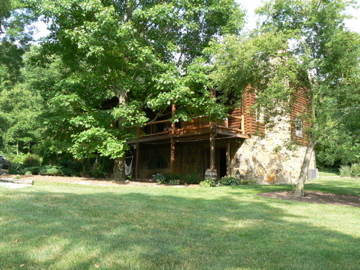 Milly's wonderful log home. The perfect site for our nature printing on metal mesh experiments. 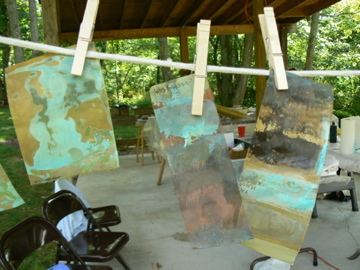 We did test strips for the various patina solutions that we used and hung them to dry. The pavilion was a great place for us to work and dry our patterned mesh. We used other items besides natural elements for the stencils. Keys, washers, lattice, alphabets. Leaves and letters applied to the mesh as stencils. Alternate view of leaves applied as stencils. Waiting for the patina to dry. Tables set up in the pavilion sheltered us from the sun. We had ample room and plenty of solutions to try. Bronze mesh patina'd and "scrunched". Milly's rubberstamp piece. The embossing can later be removed with an iron. Close-up of Milly's rubberstamped mesh. Milly, Kate and Maggie relaxing after a productive day.